doesnt defined auto make a oilpan that clears? or too pricey? they modify the back of the stock 20B oil pan to clear the FD subframe (and decreasing oil capacity. They do not do any modifications to the front of the oil pan where the sump tube is. and from my previous experiences of doing business with them, I would rather just not deal with them again. Either way you do it your gonna have to fabricate. Best to mod the oil pan unless you really know what your doing with the subframe. And if you decide to modify the steering rack mounting in any way make sure you dont have any bump steer with the final product. 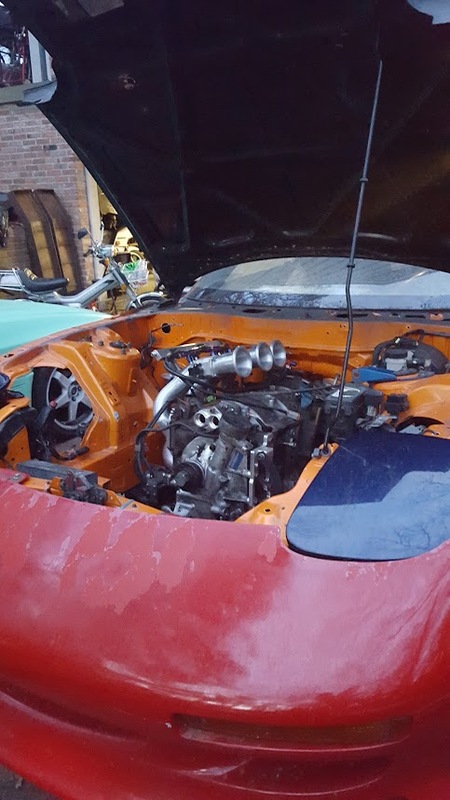 so, this past weekend I was able to get the engine test fit again with the modified subframe, depowered steering rack, stock 20B oil pan (with banzai racing oil ban brace), exhaust, trans, and intake setup. now everything clears a stock hood... without the fancy air box... so i'm running open trumpets and need to figure out filters for them. At this time, the car is stilling with a full drive train except for drive shaft and powerplant frame. one thing to note are that the header barely touches the subframe so when i pull the engine off and before the car is sent off to get the bay painted, I'll need to do a little massaging of this area. need to just notch it to clear more. otherwise, i'm happy with the clearance the steering rack has below the engine... and if i wanted about another 1/5'' of clearance from the hood, I could get some 2.4'' tall engine mounts (instead of the 2.6'' I have now) And dropping the engine lower would definitely require me notching for the header on the subframe. I'm also having to look at other options if i want to run a front strut tower bar, the one that came with the car doesn't clear the trumpets. Last edited by lt1_fd3s; 11-23-2015 at 11:24 AM..
you will now be 3rtr_fd3s or something. Looks like progress, anyway you look at it. DGRR 2016 for it? Will it be making an appearance at DGRR? Yea Tray....we need an update....anxious to see it with new paint. Nice! Sounds good too! Can't wait to see it. I cant wait to see it either! I'm guessing it'll be at B3R?